Dresses for girls Size Table means age ranges for girl, but they are for general guidance only. For most accurate fit, we recommend checking detailed measurement before purchase on the left and Second picture. Girls easter dresses made of high quality material polyester, cotton. Package included: 1x girl dress. The gowns for girls with off shoulder sleeve,back lace bowknit and hidden back zipper closure. Childern Dresses Gentle Cycle Wash and Hang Dry Recommended. Dry Clean is also an option. 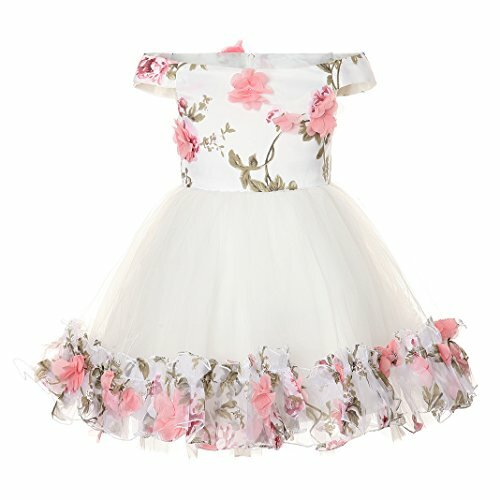 Girls lace dress suitable for wedding party, holiday party, First Communion, ceremony, baptism, birthday, pageant etc.